Well, if you, like most Internet users, are also relying on above basic security practices to spot if that "Facebook.com" or "Google.com" you have been served with is fake or not, you may still fall victim to a newly discovered creative phishing attack and end up in giving away your passwords to hackers. Antoine Vincent Jebara, co-founder and CEO of password managing software Myki, told The Hacker News that his team recently spotted a new phishing attack campaign "that even the most vigilant users could fall for." Vincent found that cybercriminals are distributing links to blogs and services that prompt visitors to first "login using Facebook account" to read an exclusive article or purchase a discounted product. That’s fine. Login with Facebook or any other social media service is a safe method and is being used by a large number of websites to make it easier for visitors to sign up for a third-party service quickly. 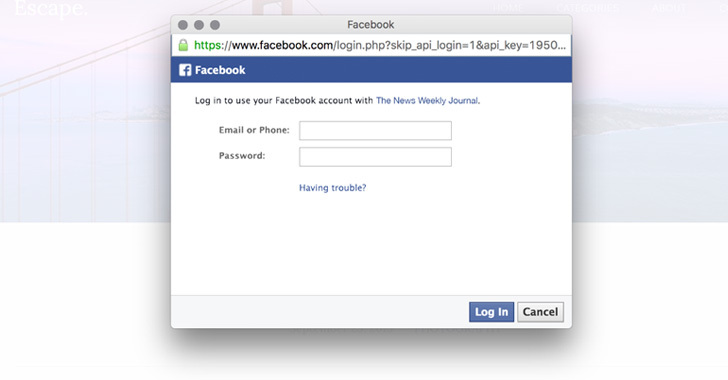 Generally, when you click "log in with Facebook" button available on any website, you either get redirected to facebook.com or are served with facebook.com in a new pop-up browser window, asking you to enter your Facebook credentials to authenticate using OAuth and permitting the service to access your profile’s necessary information. However, Vincent discovered that the malicious blogs and online services are serving users with a very realistic-looking fake Facebook login prompt after they click the login button which has been designed to capture users’ entered credentials, just like any phishing site. Moreover, users can also interact with the fake browser window, drag it here-and-there or exit it in the same way any legitimate window acts. The only way to protect yourself from this type of phishing attack, according to Vincent, "is to actually try to drag the prompt away from the window it is currently displayed in. If dragging it out fails (part of the popup disappears beyond the edge of the window), it's a definite sign that the popup is fake." Besides this, it is always recommended to enable two-factor authentication with every possible service, preventing hackers from accessing your online accounts if they somehow manage to get your credentials. Phishing schemes are still one of the most severe threats to users as well as companies, and hackers continue to try new and creative ways to trick you into providing them with your sensitive and financial details that they could later use to steal your money or hack into your online accounts.